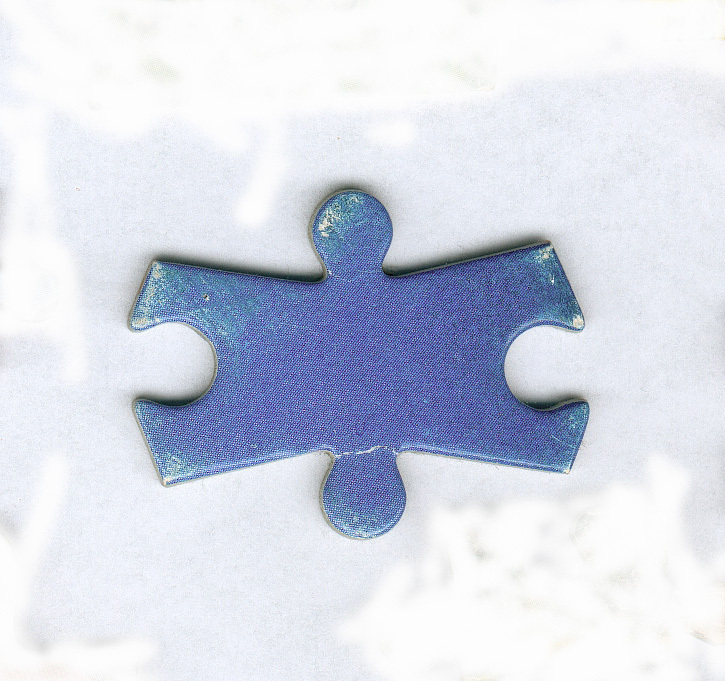 How would you describe your puzzle pieces collection found on the street? Imagine a big box with a jigsaw puzzle inside. You open it and yes, there is a puzzle, but formed by pieces that come from many others. It's a puzzle of puzzles. To me it's a universe. While it's closed, I think all the pieces have been transformed and they fit together. When I open it back, they present again their original form, none fits with none. But I'm sure that when the box is closed, they maintain much closer relationships than when scattered on the table. Each of them have written on the back the place where they were found and the date. Otherwise, there is nothing special about the collection. Only itself, I guess. When did you begin to collect these puzzle pieces? Do you remember when and which was the first one you kept? How many of them do you have today? It all began one day of 1984. I found a puzzle piece on the sidewalk, walking on the street. And I picked it up, because it was pretty. It gave me a lot to think about, I remember at home there was always a big jigsaw I used to solve as a child a couple of times per year. That puzzle was missing one piece someone replaced by an adequate-shaped cardboard piece. When I was child I wondered many times how could that piece get lost, since the puzzle never left the house. When I found my '84 piece, I figured it came from a house where everyone must be wondering the same. I got the feeling there was a worldwide conspiracy of jigsaw pieces which fled from the mother puzzle they had been created for. But I never got the certainty of it until a couple of days later, when I found another piece from a different puzzle. Since then I found about 150, of which I catalogued 55. It has been a geometric progression so far. What's hrönir? Where does the word come from? And what has it meant to you? You also have a record label by that name. That word appears on Jorge Luis Borges' story "Tlön, Uqbar, Orbis Tertius", from the book Ficciones. I quote: "It isn't unusual, in the most ancient regions of Tlön, the duplication of lost objects. Two people look for a pencil; the first one finds it and says nothing; the second one finds a second pencil not less real, but more adequate to his expectations. These secondary objects are called hrönir and they are, although in a casual sort of way, a little longer. Until recent times the hrönirs where random sons of distraction and oblivion (...) The massive investigations produce contradictory objets; now individual, almost improvised works are preferred. The methodic elaboration of hrönir has provided amazing services to the archaeologists. It has allowed to question and even modify the past, which is no less plastic and docile now than the future. A curious fact: the second and third degree hrönir ?the hrönir derived from another hrön, the hrönir derived from the hrön of a hrön- exaggerate the aberrations of the original; the fifth grade ones are almost uniform; the ninth grade ones are mistaken by the second grade ones; in the eleventh grade ones there is a purity of lines which the originals do not possess..."
Borges also says that the hrönir lose in time their consistence (and existence) if they're not looked at or touched, until they disappear completely. It is the most wonderful definition on found objects I've ever heard. I recommend reading the story, which is a true masterpiece and it explains more about those desire objects. It explains quite well how come I never stopped founding puzzle pieces and why these things happen to all of us. About the Hrönir label, that's the record label by which I release my records. My music is also made by sound puzzle pieces. I trace randomly the whole planet short wave and I sample bits with which I build my music. I ended up linking both things and I wanted to reflect that on the label's name. What's the most appealing thing about this object, to begin and keep this collection for years? First, that finding magic. Then there's the shapes, as different as they are familiar. And of course, what you can suspect in each piece, like holograms' fragments, they keep a special part of the whole, it's just that sometimes I can only suspect it and other times, almost guess the whole thing. Others are as cryptic and unintelligible as they are fascinating, well, I keep a really passionate relation with my collection. What are the requisites a jigsaw piece must have to be considered good, collection worthy? Are all of the ones you get allowed in your collection? Do you reject some? If so, why? I only discard two kinds of pieces: the "faceless" ones, the ones that have lost their image because of the rain or because they're really worn out, and just keep the backprint. And the ones that belong to the same puzzle: if I find a puzzle scattered on the street (which occurs now and then, perhaps because their owners threw it away on account of missing pieces! ), I just pick one up and discard the rest. How do you classify them? Where do you keep them? Is the physical space important for being a great collector? They live in a box. Each piece has the place and date of the finding written on the back. The box is next to another box, that contains complementary aspects of the collection. I don't keep it in folders, like a coin collection, since I believe that jigsaw pieces must be always kept in boxes or cans. It's their natural environment. Then, when you look at it, you must scatter it on a table. I also have them scanned, although I rarely find time for that task. The physical space is important. Look, one thing happened to me: I once began to collect those oval stickers on fruit and I used to stick them on the kitchen's door frame. I had to move out and they remained there, I couldn't take the door with me. Now I hook them to a notepad, but I had to start over... each collection demands its space. I collect sea stuff. From images to objects, and its space is a room. At home we call it the "sea room". They demand an ample space, but they don't get in the way of daily life, we eat on that room, and it's very inspiring to eat surrounded by sea stuff, since we love to eat fish. How do you keep a jigsaw pieces collection? I mean, how do you get them? Are only the ones you personally find good? Is it difficult to achieve a large collection? Although on the first years I wished to find these puzzle pieces often, and I used to find many, I found out that there was a higher finding frequency when significant things happened in my life, so I gave it a deeper sense, finding a piece was like getting to a crossroad, the piece became an amulet, and that influence the piece had in me held back the appearance of new pieces. Even so, the best ones are the ones I find unexpectedly, those are the ones I value the most. But the pace has become stable now, although the parallel collection has increased a lot: Every time I tell people about this collection, they start to find them for themselves. Nowadays I receive puzzle pieces from many parts of the world, they have the name of the finder, the place and the date written. That collection outnumbers my own, and I call it "jigsaw pieces found by Victor Nubla's friends". When I explain this, they always tell me: that's unlikely. And later on they write me saying "I found one". They end up being regular piece senders. Would you sell your collection if you had to? Definitely, no. I came up with an alternative idea: every now and then, I photograph the collection on a black background. Then I make a series of ten cut-out puzzles over the image of my pieces over black background. The result is a puzzle that's impossible to solve if you try it over another black background. It's amazing: the border of the puzzle doesn't coincide with the shape of the pieces you suspect on it, and there's no way. Those boards are for sale, but so far no one has bought them. They're anti-puzzles, it must be a protection of my personal sense of the collection. I heard you did many exhibitions of your jigsaw pieces. How does the public react? Are you planning a new exhibition soon? I've exhibited the pieces many times. First in the 2nd Exhibition of Musician/Painters in Barcelona, they were on a showcase. Soon afterwards, in Macromassa's exhibition, "Alas Plegables 3", in the same format, but there were already more pieces. They both took place at the end of the '80s. The third time it was at the Barcelona University, in a collective exhibition where unusual music sheets made through artistic means. That time I made a triangle sheet with puzzle pieces, giving their concavities and convexities a reading sense. The piece was premiered the opening day. Then it was exhibited in southern France, I think it was Avignon. These pieces never returned to the box, they're still on the music sheet, in a big folder. Then I took part on a collective exhibition at the Footwear Museum in Barcelona, and I exhibited the cardboard piece of my family's puzzle, since it replaced the shoe of one of the characters in the puzzle, a '50s board representing a scene at an English airport, a magnificent work of "clear line", like something out of a Tintin comic book. And last December I gave a lecture at the Buenos Aires' Modern Art Museum where I explained my collection. In the very city of Borges. That was a great honor to me. What would be your advice to anyone who'd like to start a similar collection? I'd say that if you find a similar collection, you had to be a total collector yourself, first of all. Arriving to this is like a lucky thing, an added value to your collector's life. Something that makes carrying on worthwhile . Of all the pieces, which one's your most valuable and why? The first one, of course, but also some of which I consider well-balanced in shape and with a suggesting image, like the one I use as the record label logo. Then there's also the rarities, like puzzles with relief or angle-shaped ones. Other ones, on account of their origin, such as one I got, found the 9/9/2000 at 8 pm at the Atatürk bridge, Istanbul. What joy or reward you find in collecting the jigsaw pieces? And what inconveniences? It's a part of my life, it's less tedious to me than watching television. It's much more interesting. It has no inconveniences, provided that no one thinks I'm nuts. How many of your free time does this hobby take up? Only the ones I spend walking on the street. Then a couple of hours a week to maintain the collection. Do you have other collections? If so, which ones? Describe it, how many of them do you have, and what kind are they? When did you begin to collect them and why? What's the appealing thing about them? I keep many collections, the largest one being a rubber stamp collection, the ones you stamp on an ink pad. I have hundreds of them. They usually appear in the traces of every city, by thousands. The hard thing is to choose. But I have great stamps, like one of the Fari fan club, another one of a full score, huge, and others from the "colonial" stores, where reads "bananas" and that sort of things. This hobby has led me to collect the impressions of the rubber stamps as well, like the headings of letters, and especially from the mail-art era, in the '70s and '80s. I have a book full of rubber stamp impressions. It's really cool, because it sums up an era. Another star collection I have is from that era too: I used to collect defective matches, sometimes with two sticks or two heads, or with weird heads. I exhibited them in 1986 at the Andujar house of culture under the name "Jewels"*. Each one of them was inside a small plastic urn, over a velvet background. But I gave away that entire collection, with a certificate, and I haven't ever continued it. I like to collect equal things too. Objects I have of which I find an exact replica somewhere. It's not an easy collection, but it's very rewarding. On the other hand, the collection of playing cards found on the street is really boring, I never find a reward on that one, though it might seem like the jigsaw one, it's nothing like it, every card belong to the same board. I also collected fake coins and bank notes, all kind of reproductions, trading cards and "legal course" fakes, but it's also a boring collection. Let's not talk about the 5.000 postcards I don't know where to put, that box that follows me from house to house. In addition, I'm a constant record collector, although not compulsive. What do your friends think about your collections? They usually participate. I have few non-collector friends. Have you ever solved a jigsaw puzzle? Do you like them? I solved my family's puzzles, every year, until I learned them by heart, but as an unimportant activity. I don't especially like puzzles, but I do like the concept of jigsaw puzzles.